PROF. C. PIAZZI SMYTH, F.R.S.E., F.R.A.S. Dear Sir: I have been rather longer than I could have wished in looking over the MS. of your friend, C. T. Russell of Allegheny, Pa., but I have now completed a pretty careful examination, word by word. And that was the least I could do, when you so kindly took the pains to send it with such care between boards by registered parcel, with every page flat, and indited by the typewriter in place of the hand. At first I could only find slips of the said typewriter, but as I progressed through the pages, the powers, the specialties and the originalities of the Author came out magnificently; and there were not a few passages I should have been glad to take a copy of for quotation, with name, in the next possible edition of my own Pyramid book. But of course I did nothing of that sort, and shall wait with perfect patience and in most thankful mood of mind for when the author of Scripture Studies shall choose his own time for publishing. So I merely remark here that he is both good and new in much that he says on the chronology of various parts of the Pyramid, especially the First Ascending Passage and its granite plug; on the Grand Gallery, as illustrating the Lord's life; on the parallelisms between the King's Chamber and its granite, against the Tabernacle and its gold; and generally on the confirmations or close agreements between Scripture and the Great Pyramid, well commented on. In the meanwhile, it seems that I am indebted to you for your kind gift of long ago of the first two volumes of Scripture Studies. I did not at the time get further than the first half of the first volume, finding the matter, as I thought, not quite so new as I had expected. But after having profited, as I hope, so much by a thorough reading of this advanced pyramid chapter of the third volume, I must take up the first two volumes again, de novo. General Description of the Great Pyramid – Why of Special Interest to Christians – The Great Pyramid a Storehouse of Truth – Scientific, Historic and Prophetic – Bible Allusions to It – Why, When and by Whom Built – Importance of Its Location – Its Scientific Lessons – Its Testimony Concerning the Plan of Redemption – The Plan of the Ages – The Death and the Resurrection of Christ Indicated – The Downward Course of the World, Ending in a Great Time of Trouble – The Nature of the Trouble – The Great Reformation Movement Marked – Length of the Jewish Age Indicated – The "High Calling" of the Gospel Church Shown – The Course of the Church's Consecration – The End of the High Calling Marked – Date of the Second Advent of Christ – How Restitution Blessings for the World are Indicated – The Course of the World During the Millennial Age – Its End – Contrast of the Two Conditions, Human and Spiritual, as Indicated in the Pyramid – The Pyramid Refutes Atheism, Infidelity and all Evolution Theories, and Verifies both the Plan of the Bible and Its Appointed Times and Seasons. HE ancients recounted seven wonders of the world, and at the very head of the list named the Great Pyramid of Gizeh. It is situated in Egypt, not far from the present city of Cairo. No other building in the world equals it in size. One of the leading granite men of this country, who made a personal inspection of the Great Pyramid, says: "There are blocks of stone in the Pyramid which weigh three or four times as much as one of the obelisks. I saw a stone whose [C314] estimated weight was 880 tons. There are stones in it thirty feet in length which fit so closely together that you may run a penknife over the surface without discovering the breaks between them. They are not laid with mortar, either. There is now no machinery so perfect that it will make two surfaces thirty feet in length which will meet together as these wonderful stones in the Great Pyramid meet." It covers an area of about thirteen acres. It is 486 feet high and 764 feet broad at its base. It is estimated that the Great Pyramid weighs six million tons, and that to remove it would require six thousand steam engines, each drawing one thousand tons. In fact, the wealth of Egypt is not sufficient to pay laborers to demolish it. From these facts it is evident that, whoever was its great designer, he intended that it should be an enduring monument. Viewed from whatever standpoint we please, the Great Pyramid is certainly the most remarkable building in the world; but in the light of an investigation which has been in progress for the past thirty-two years, it acquires new interest to every Christian advanced in the study of God's Word; for it seems in a remarkable manner to teach, in harmony with all the prophets, an outline of the plan of God, past, present and future. It should be remembered that, aside from the Great Pyramid here referred to, there are others, some of stone and some of brick; but all of them are mere attempts to copy it, and are in every way inferior – in size, accuracy and internal arrangement. And it has also been demonstrated that, unlike the Great Pyramid, they contain no symbolic features, but were evidently designed and used as sepulchers for the royal families of Egypt. The Great Pyramid, however, proves to be a storehouse of important truth – scientific, historic and prophetic – and its testimony is found to be in perfect accord with the Bible, [C315] expressing the prominent features of its truths in beautiful and fitting symbols. It is by no means an addition to the written revelation: that revelation is complete and perfect, and needs no addition. But it is a strong corroborative witness to God's plan; and few students can carefully examine it, marking the harmony of its testimony with that of the written Word, without feeling impressed that its construction was planned and directed by the same divine wisdom, and that it is the pillar of witness referred to by the prophet in the above quotation. If it was built under God's direction, to be one of his witnesses to men, we might reasonably expect some allusion to it in the written Word of God. And yet, since it was evidently a part of God's purpose to keep secret, until the Time of the End, features of the plan of which it gives testimony, we should expect that any reference to it in the Scriptures would be, as it is, somewhat under cover – to be recognized only when due to be understood. In many passages of Scripture the symbolic character of Egypt is indicated; for instance, Hosea 11:1 and Matt. 2:13-15. Here, aside from the fact that our Lord as a babe was for a time actually in the land of Egypt, and Israel also for a time actually in Egypt, there is evidently a typical significance as well. The Son of God was in the world for a time for the sake of those he came to redeem and deliver; but he was called out of it – Egypt – to the higher, divine nature. Likewise those who are called to be his brethren and joint-heirs, the "members of his body," the true Israel of God, are called out of Egypt; and the Master testifies, "They are not of this world, even as I am not of this world." Isaiah (31:1,3), referring to the great trouble now impending, says, "Woe unto them that go down to Egypt [to the world] for help [for worldly ideas and plans, and for counsel as to how they should act in the crisis of this great day]; and stay on horses [who endeavor still to ride the old, false doctrinal hobbies], and trust in chariots [worldly organizations] because they are many; and in horsemen [the great leaders in false doctrines] because they are very strong; but who look not unto the Holy One of Israel, neither seek the Lord [for the safety and victory in this day of trouble will not be with the multitude]!...Now the Egyptians are men, and not God, and their horses flesh, and not spirit. When the Lord shall stretch out his hand [his power – the power of the truth and other agencies – as he will do shortly], both he that helpeth shall fall, and he that is helped [by the powers of Egypt – the world's ideas] shall fall down, and they all shall fail together." Jeremiah (32:20), when speaking of God's mighty works, declares that he hath "set signs and wonders in the land of Egypt, even unto this day." God showed signs and wonders in Egypt when he brought Israel out in triumph; but he also "set signs and wonders" there, which remain "even unto this [our] day." The Great Pyramid, we believe, is the principal one of these very signs and wonders; and it now begins to speak to scientists in their own language, and through them to all men. The Lord's questions and statements to Job (38:3-7), concerning the earth, find a remarkable illustration in the Great Pyramid, which is believed, in itself and by its measurements, to represent the earth and God's plan with reference to it. The illustration used is that of a building, and we believe that it fits only to a structure of pyramid shape. The language, while it applies primarily to the earth, is framed to fit the illustration given in the Great Pyramid. First, the preparation of the foundation, the rock on which the Great Pyramid is built, is noted. Second, the arrangement of its measures, a feature very prominently shown in the Great Pyramid, which abounds in significant measurements. "Who hath stretched the line upon it?" The perfection of the shape of the Great Pyramid, and its exactness in every respect, prove that its construction was guided by some master architect. "Whereupon are the sockets thereof made to sink?" The Great Pyramid has four corner socket-stones sunk into the solid rock. "Or who laid the corner-stone thereof?" A pyramid has five corner-stones, but the reference here is to one particular corner-stone – the top stone. The four sunk as socket-stones into the rock have already been referred to, and the remaining one is the top corner-stone. This is the most remarkable stone in the structure – itself a perfect pyramid, the lines in the entire structure conform to it. The question, therefore, with reference to it is significant, [C319] and calls attention to its peculiar fitness, and the wisdom and skill which prepared and placed it as the top stone. This ancient structure being thus repeatedly referred to in the Scriptures, we cannot doubt that, if questioned, this "Witness" of the Lord in the land of Egypt will bear such testimony as will honor Jehovah, and fully correspond with his written Word. We thus introduce this "Witness" because the inspiration of its testimony will doubtless be as much disputed as that of the Scriptures, by the prince of darkness, the god of this world, and those whom he blinds to the truth. was the Great Pyramid Built? This question has been much discussed of late years, from both scientific and Scriptural standpoints. For thousands of years no satisfactory answer to the question was discovered. The old theory that it was built as a vault or tomb for an Egyptian king is unworthy of credence; for, as we shall see, it required more than the wisdom of the present day, to say nothing of that of Egypt four thousand years ago, to design such a structure. Besides, it contains nothing in the way of casket, mummy or inscription. It was not until we had come into the time called in Daniel's prophecy "the Time of the End," when knowledge should be increased, and the wise should understand God's plan (Dan. 12:4,9,10), that the secrets of the Great Pyramid began to be understood, and our questions began to have a reasonable answer. The first work of importance on the subject, proving that the Great Pyramid possessed scientific features, was by Mr. John Taylor, of England, A.D. 1859, since which time the attention of many able minds has been given to the further study of the testimony of this wonderful "Witness"; especially [C320] since Prof. Piazzi Smyth, Astronomer-Royal for Scotland, visited it, for several months made its peculiarities a study and gave to the world the remarkable facts of its construction and measurements, and his conclusions therefrom. To his scholarly and scientific work, "Our Inheritance in the Great Pyramid," we are mainly indebted for the data made use of in this chapter. Our illustrations are copies of a few of the twenty-five plates with which the latest edition of that work is embellished. A few years after Prof. Smyth's return, came the suggestion that the Great Pyramid is Jehovah's "Witness," and that it is as important a witness to divine truth as to natural science. This was a new thought to Prof. Smyth, as well as to others. The suggestion came from a young Scotsman, Robert Menzies, who, when studying the scientific teachings of the Great Pyramid, discovered that prophetic and chronological teachings coexist in it. Soon it became apparent that the object of its construction was to provide in it a record of the divine plan of salvation, no less than the record of divine wisdom relating to astronomical, chronological, geometrical, and other important truths. However, not having discerned the scope and completeness of the plan of salvation revealed in the Scriptures, these gentlemen have thus far failed to note the most wonderful and beautiful features of the Great Pyramid's testimony in this direction, which we now find to be a most full and complete corroboration of the plan of the ages and the times and seasons therewith associated, as taught in the Scriptures and presented in this and the preceding volumes of the Scripture Studies series. And, further, we see that this storehouse of knowledge, like the major part of the Bible store, was kept purposely sealed until its testimony should be needed and appreciated. Does this imply that its great Architect knew that a time would come when its testimony [C321] would be necessary? In other words, that a time would come when God's written Word would be lightly esteemed, and even his very existence questioned? when human philosophy, under the name of science, would be lauded and every proposition subjected to its tests? Has God decided to prove himself and his wisdom by those very tests? So it would appear. This structure will yet confound the wisdom of the wise as a "Witness" for the Lord of hosts – "IN THAT DAY" – which is already begun. This conclusion of Prof. Smyth's as to the date of the Great Pyramid's building, was most abundantly corroborated, later, by certain measurements by which the Great Pyramid indicates its own date of construction. A realization of the fact that the Great Pyramid exhibits a wisdom of design which the Egyptians could not have possessed – a divine wisdom which must have been worked out under the supervision of some inspired servant of God – has led to the conjecture that Melchizedek was its builder. He was "king of Salem [that is, king of peace] and priest of the Most High God," and as a person and type occupied so high a position as to be a blesser of Abraham, who also paid him tithes. Of this we can know little, except that Melchizedek was a great and peaceful king, and that he lived about that time, and not far distant from the site of the Great Pyramid. It is conjectured that Melchizedek, though not himself an Egyptian, used Egyptian labor for the construction of the Great Pyramid. And to some extent the traditions of Egypt support such a theory. They reveal the fact that Egypt had a peculiar invasion about this date by a people whom tradition merely denominates Hyksos (i.e., Shepherd Kings or Peaceful Kings). These invaders seem not to have attempted to disturb the general government of Egypt, and, after staying a time for some purpose not recognized by the tradition, they left Egypt as peacefully as they had come. These Hyksos or Peaceful Kings are supposed to include Melchizedek, and are assumed to have been the builders of the Great Pyramid – God's altar and "Witness" in the land of Egypt. Manetho, an Egyptian priest and scribe, is quoted by Josephus and others as saying: "We had formerly a king whose name was Timaus. In his time it came to pass, I know not how, that the deity was displeased with us; and there came up from the East, in a strange manner, men of ignoble [C323] [C324] [C325] race [not warriors], Hyksos, who had the confidence to invade our country and easily subdue it by their power without a battle. And when they had our rulers in their hands, they demolished the temples of the gods." The Great Pyramid is situated on an elevated rocky plain, overlooking the river Nile, not far from the city of Cairo, in Egypt. 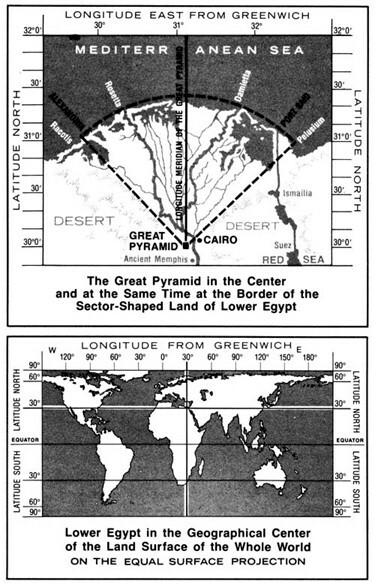 A remarkable thing in connection with its situation is, that the delta of the Nile forms a seacoast which in shape is a true quarter circle, with the Great Pyramid marking the inner angle. This relationship of the Great Pyramid to the coast was discovered by Mr. Henry Mitchell, Chief Hydrographer of the United States Coast Survey, who visited Egypt in 1868 to report the progress of the Suez Canal. His observation of the regularity of the curvature along the whole of Egypt's northern coast led him to conclude that some central point of physical origination was indicated. On searching for this grand center, he found it marked by the Great Pyramid, which led him to exclaim: "That monument stands in a more important physical situation than any other building erected by man." A line drawn from the entrance passage due north would pass through the northernmost point of Egypt's coast; and lines drawn in continuation of the northeast and northwest diagonals of the structure would enclose the delta's either side, thus embracing the fan-shaped country of Lower Egypt. (See illustration, page 323.) Built upon the northernmost edge of the Gizeh cliff, and looking out over this sector, or open fan-shaped land of Lower Egypt, it may be truly said to be at the very border thereof, as well as in its nominal center, as described by the prophet Isaiah. "In that day shall there be an altar to the Lord in the midst of the land [C326] of Egypt, and a pillar [pyramid] at the border thereof, to the Lord. And it shall be for a sign and for a witness unto the Lord of hosts in the land of Egypt." Another fact worthy of notice is that the Great Pyramid is located in the geographical center of the land surface of the world – including North and South America, unknown for centuries after the location and construction of the Great Pyramid. The Great Pyramid speaks to us, not by hieroglyphics, nor by sketches, but only by its location, its construction and its measurements. The only original marks or figures found were in the "Construction Chambers" over the "King's Chamber"; there are none whatever in the passages and rooms of the Pyramid proper. The scientific lessons of the Great Pyramid we omit for economy of space, because not one in a hundred ordinary readers would understand the scientific terms, so as to appreciate the demonstrations, and especially because they would be no part of the gospel which it is our mission to present. Suffice it, therefore, that we merely suggest the manner in which it teaches the scientist. For instance: The measure of the base of the four sides, at the level of the "sockets," added, is found to be as many pyramid cubits as there are days in four years, to the fraction – including the leap year fraction. The measures diagonally across the base from northeast to southwest, and from northwest to southeast, added, give as many inches as there are years in the precessional cycle. This cycle astronomers had already concluded to be 25,827 years, and the Great Pyramid corroborates their conclusion. The distance to the sun it is claimed is indicated, by the height and angle of the Great Pyramid, to be 91,840,270 miles, which almost exactly corresponds with the latest figures reached by astronomers. Astronomers until recently had calculated this distance to be from ninety to ninety-six millions of miles, [C327] their latest calculation and conclusion being ninety-two millions. The Great Pyramid has also its own way of indicating the most correct standard of all weights and measures, based upon the size and weight of the earth, which it is also claimed to indicate. "There is a yet grander thought embodied in this wonderful structure. Of its five points there is one of special pre-eminence, in which all its sides and exterior lines terminate. It is the summit corner, which lifts its solemn index finger to the sun at midday, and by its distance from the base tells the mean distance to that sun from the earth. And if we go back to the date which the Pyramid gives itself and look for what that finger pointed to at midnight, we find a far sublimer indication. Science has at last discovered that the sun is not a dead center, with planets wheeling about it, and itself stationary. It is now ascertained that the sun also is in motion, carrying with it its splendid retinue of comets, planets, its satellites and theirs, around some other and vastly mightier center. Astronomers are not yet fully agreed as to what or where that center is. Some, however, believe that they have found the direction of it to be the Pleiades, and particularly Alcyone, the central one of the renowned Pleiadic stars. To the distinguished German astronomer, Prof. J. H. Maedler, belongs the honor of having made this discovery. Alcyone, then, as far as science has been able to perceive, would seem to be 'the midnight throne' in which the whole system of gravitation has its central seat, and from which the Almighty governs his universe. And here is the wonderful corresponding fact, that at the date of the Great Pyramid's building, at midnight of the autumnal equinox, and hence the true beginning of the year* as still preserved in the traditions of many nations, the Pleiades [C328] were distributed over the meridian of this Pyramid, with Alcyone (A Tauri) precisely on the line. Here, then, is a pointing of the highest and sublimest character that mere human science has ever been able so much as to hint, and which would seem to breathe an unsuspected and mighty meaning into that speech of God to Job, when he demanded, 'Canst thou bind the sweet influences of Pleiades?'" *The beginning of the Jewish year, introduced by the Day of Atonement, as shown in Scripture Studies, Vol. II. While every feature of the Great Pyramid's teaching is important and of interest, our greatest interest centers in its silent but eloquent symbolism of the plan of God – the Plan of the Ages. It would be impossible, however, to understand God's plan as illustrated by it, had we not first discovered that plan in the Bible. But having seen it portrayed there, it is strengthening to faith to see it again so beautifully outlined here; and to notice, further, that both the truths of Nature and the truths of Revelation are owned and testified to by the same great Author in this wonderful stone "Witness." In this aspect of its teaching, the Great Pyramid, viewed from without, has a beautiful significance, representing the plan of God completed, as it shall be at the end of the Millennial age. The crowning feature will be Christ, the acknowledged Head over all; and each other stone will be fitly framed into the glorious building, complete and perfect. All this chiseling, polishing and fitting process will then be completed, and all will be bound and cemented together, to each other and to the Head, with love. If the Great Pyramid, as a whole, represents the plan of God complete, its top corner-stone should represent Christ, whom God hath highly exalted to be Head over all. And that it does represent Christ is indicated, not only by its exact fitness as a symbol of Christ,* but also by numerous references [C329] to the symbol by prophets and apostles and by our Lord Jesus himself. *See Vol. I, Chap. v; also the Chart of the Ages, Vol. I, x,y,z,W. How perfectly the head-stone of the Great Pyramid illustrates all this! The head-stone, being first finished, would serve the workmen as a pattern or model for the whole [C330] structure, whose angles and proportions must all be conformed to it. But we can readily imagine that, before this top-stone was recognized as a pattern for the whole structure, it would be rejected, set at naught, by the builders, some of whom could think of no place suitable for it; its five sides, five corners and sixteen different angles making it unsuitable to the structure until the very top-stone was needed, and then no other stone would do. During all the years in which the building work progressed, this Chief Corner-stone would be a "stone of stumbling" and a "rock of offense" to those not acquainted with its use and place; just as Christ is, and will continue to be, to many, until they have seen him exalted as the Head-Corner-Stone of God's plan. But while the outward testimony of this great structure is thus complete, and in accord with God's written revelation, its inner construction is even more wonderful. While its outward form illustrates the completed results of God's Plan of Redemption,* the inner construction marks and illustrates every prominent feature of that plan as it has developed from age to age, down to its glorious and complete consummation. Here the stones upon the various levels or planes represent the perfection of all who, under Christ [C331] Jesus our Head, shall become conformed to God's perfect will, as we have already seen from Scripture testimony. Some will be perfected on the human plane and some on the spiritual and divine planes or natures. Thus the floor of the "King's Chamber" is described as being on the fiftieth course of masonry, that of the "Queen's Chamber" on the twenty-fifth course, and the lower end of the "First Ascending Passage," if extended by the "Plug," as will presently be shown, would reach down to the basal line of the Pyramid. Thus from its base-line upward the Great Pyramid seems to stand as an emblem of God's plan of salvation, or lifting up out of sin and death, provided for all mankind. The base-line thus corresponds with the date of the confirmation of God's promise to typical Israel – the beginning of the uplifting or saving process. *See the Chart of the Ages in Vol. I. A careful study of the accompanying diagram, showing the interior arrangement of this wonderful structure, is suggested. The Great Pyramid has but one proper "Entrance Passage." This passage is regular, but low and slanting, and leads down to a little room or "Subterranean Chamber," cut in the rock. This room is of peculiar construction, the ceiling being well finished, while the sides are only commenced and the bottom is rough and unfinished. This to some minds has suggested the thought, "bottomless pit," which term is used in the Scriptures to represent disaster, oblivion and extinction. This "Entrance Passage" fitly represents the present downward course of mankind toward destruction; while the "Subterranean Chamber," by its peculiar construction, illustrates the great trouble, disaster, destruction, the "wages of sin," to which the downward course leads. The "First Ascending Passage" is of about the same size as the "Entrance Passage," from which it branches off. It is small, low and difficult of ascent, but opens at its upper end into a large, elegant hallway, called the "Grand Gallery," [C332] the ceiling of which is at seven times the height of the passages leading to it. The low "Ascending Passage" is supposed to represent the Law dispensation, and Israel as a nation, from the going out of Egypt. There they left the nations of the world and their downward course, to be God's holy nation and under his law – proposing thenceforth to walk an upward and more difficult path than that of the heathen world, viz., to keep the Law. The "Grand Gallery" is understood to represent the period of the Gospel call – still upward and difficult, but not hampered as that behind it. The loftiness and greater width of this passageway well represent the grander hopes and greater liberties of the Christian dispensation. On a level with the floor of the "Grand Gallery" at its lower end, there starts a "Horizontal Passage" under it, which leads to a little room commonly termed the "Queen's Chamber." At the upper end of the "Grand Gallery" is another low passageway, leading into a little room called the "Ante-Chamber" which is of very peculiar construction, and which to some has suggested the idea of a school – a place for instruction and testing. 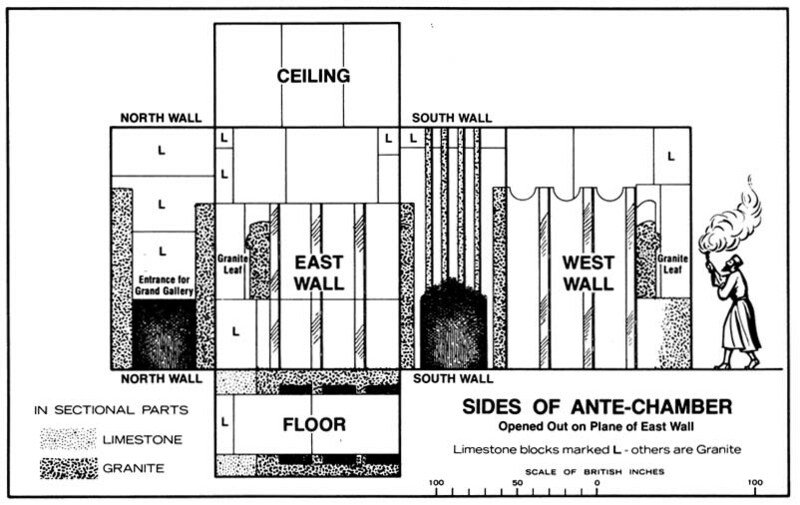 But the chief room of the Great Pyramid, for both size and importance of location, is a little farther along, and separated from the "Ante-Chamber" by another low passageway. This room is known as the "King's Chamber." Over it are a number of small apartments called "Construction Chambers." The significance of these, if they have any significance, relates not to man, nor to any other creature which walks, but to spirit beings; for it will be observed from the diagram that though the sides and the top are squared and finished, there is no floor surface to any of them. The "King's Chamber" contains a "Coffer" or stone box, the only piece of furniture found in the Great Pyramid. Ventilation is provided in the "King's Chamber" by [C333] [C334] [C335] two air-passages which pierce its walls on opposite sides and extend to the outer surface – left for this purpose by the builders. It has been speculated by some that there are yet other rooms and passages for future discovery; but we do not share this opinion; to us it seems that the passages and rooms already discovered fully serve the divinely intended purpose in witnessing to the entire plan of God. From the west side of the lower or north end of the "Grand Gallery," extending downward, there is an irregular passage called the "Well," leading into the descending "Entrance Passage." Its route passes through a grotto in the natural rock. The connection between this passage and the "Grand Gallery" is very disordered. It would appear that originally the passageway into the "Queen's Chamber" had been concealed, being covered by the flooring slabs of the "Grand Gallery"; and also that a stone slab covered the mouth of the "Well." But now the whole lower end of the "Grand Gallery" is torn away, opening the passage to the "Queen's Chamber," and leaving the "Well" open. Those who have been there and who have examined it say that it looks as though an explosion had taken place at the mouth of the "Well," bursting it open from beneath. It is our opinion, however, that no such explosion ever occurred; but that things were left by the builders as they are, purposely, to indicate the same thing that would be indicated by the supposed explosion, which will be referred to later. As a matter of fact, none of these stones are now to be found, and it would have been very difficult to remove them. At the upper or south end of the "Grand Gallery," the floor-line of the "Ante-Chamber" and the "King's Chamber" extends into the "Grand Gallery," forming an abrupt barrier, or high step at its upper end. This step projects from the south wall sixty-one inches. This south end wall of the "Grand Gallery" has a peculiarity also: it is not vertical, but leans [C336] northward – at the top 20 inches* – and at its very top there is an opening or passageway connecting with the so-called "Construction Chambers" over the "King's Chamber." The passageways and floors of the Pyramid are of limestone, as indeed is the entire structure, except in the "King's Chamber," the "Ante-Chamber" and the passage between them, where the floors and ceilings are of granite. The only piece of granite elsewhere in the structure is the granite "Plug," which is tightly wedged in the lower end of the "First Ascending Passage." As originally left by the builders, the "First Ascending Passage" was sealed with a close-fitting angular stone at its lower end, where it connects with the "Entrance Passage"; and this was so neatly done that the "First Ascending Passage" was unknown until, in "due time," the stone fell. Close to the lower end of this "First Ascending Passage," and just behind the sealing stone, was the granite "Plug," made slightly wedge-shaped, and evidently intended to remain there, as it has thus far resisted all efforts to remove it. Though the "Entrance Passage" was well known to the ancients, as attested by historians, yet Al Mamoun, an Arabian Caliph, was evidently ignorant of its exact situation, except that tradition located it on the north side of the Pyramid, when, in A.D. 825, at great expense he forced an entrance, as shown on the diagram, in the hope of finding wonderful treasures. But though it contained vast intellectual treasures, now being appreciated, it contained none of the kind sought by the Arabs. Their labor, however, was not wholly in vain; for, while they worked the stone which sealed the upward passage jarred from its position, fell into the "Entrance Passage" and told the secret, thus disclosing the "First Ascending Passage." The Arabs supposed [C337] that they had at last found the way to secreted wealth, and, unable to remove the granite "Plug," they forced a passage along-side quarrying much more easily the softer limestone. "From the north beginning of the Grand Gallery, in upward progression, begin the years of our Savior's life, expressed at the rate of an inch to a year. Three and thirty inch-years, therefore, bring us right over against the mouth of the Well." Yes, that "Well" is the key, so to speak, to the whole story. It represents not only our Lord's death and burial, but also his resurrection. This last is shown by the feature already noted, that the mouth of the "Well" and its surroundings look as though an explosion had burst it open from beneath. Thus our Lord burst the bonds of death, thereby bringing life and immortality to light – opening up a new way to life. (Heb. 10:20) It was not possible for him to be holden of death (Acts 2:24), is the seeming language of the torn rocks surrounding the upper opening of this "Well." As the "Well" was the only way of access to each of these upward passages of the Great Pyramid, so by the death and resurrection of our Redeemer is the only avenue to life on any plane for the fallen race. As the "First Ascending Passage" was there, but impassable, so the Jewish or Law Covenant stood as a way to or offer of life, but a useless or impassable way to life: none of the fallen race ever could or ever did reach life by walking its prescribed course. "By the deeds of the law shall no flesh be justified" to life. (Rom. 3:20) That [C338] which the "Well" symbolizes, viz., the ransom, is the only way by which any member of the condemned race can reach the grand provision of the divine plan – lasting life. Years before this suggestion, that the "Grand Gallery" represents the Christian dispensation, Prof. Smyth had, by astronomical observation, fixed the date of the building of the Pyramid at B.C. 2170; and when Mr. Menzies suggested that the floor-line inches of the "Grand Gallery" represent years, it occurred to some one that, if that theory were true, the measuring of the floor-line backward from the lower edge of the "Grand Gallery," down the "First Ascending Passage" to its junction with the "Entrance Passage" and thence upward along the "Entrance Passage" toward the Pyramid's entrance, should discover some mark or indication in the passageway to correspond, and thus prove the date of the Pyramid's construction, and the correctness of the inch-year theory. This, though not unreasonable, was a crucial test, and the service of a civil engineer was obtained to visit the Great Pyramid again and make very accurate measurements of passages, chambers, etc. This was in 1872; and the report of this gentleman was confirmatory to the last degree. His measurements show the floor-line just described to be 2170 ½ inches to a very finely ruled line in the walls of the "Entrance Passage." Thus the date of its construction is doubly attested, while the floor-lines of its passages are shown to be scrolls of history and chronology, which shall yet be generally heard as "a witness unto the Lord in the land of Egypt." Here, thanks to the very accurate measurements of all the passages, furnished by Prof. Smyth, we are enabled to reach what to us are by far the most interesting features of the testimony of this "Witness" yet delivered. When we first came to appreciate what we have already mentioned of the testimony of the Great Pyramid, we said [C339] [C340] [C341] at once, If this, indeed, prove to be a Bible in stone; if it be a record of the secret plans of the Great Architect of the universe, displaying his foreknowledge and wisdom; it should and will be in full accord with his written Word. The fact that the Pyramid's secrets were kept until the close of six thousand years of the world's history, but that it now begins to give its testimony as the Millennial Dawn draws on, is in perfect harmony with the written Word, whose abundant testimony relative to the glorious plan of God has likewise been kept secret from the foundation of the world, and only now is beginning to shine forth in its completeness and glory. The "Descending Passage," from the entrance of the Great Pyramid, leading to the "Pit" or "Subterranean Chamber," represents the course of the world in general (under the prince of this world), into the great time of trouble (the "Pit"), in which evil shall be brought to an end. [C342] The measuring of this period and determining when the pit of trouble shall be reached are easy enough if we have a definite date – a point in the Pyramid from which to start. We have this date-mark in the junction of the "First Ascending Passage" with the "Grand Gallery." That point marks the birth of our Lord Jesus, as the "Well," 33 inches farther on, indicates his death. So, then, if we measure backward down the "First Ascending Passage" to its junction with the "Entrance Passage," we shall have a fixed date to mark upon the downward passage. This measure is 1542 inches, and indicates the year B.C. 1542, as the date at that point. Then measuring down the "Entrance Passage" from that point, to find the distance to the entrance of the "Pit," representing the great trouble and destruction with which this age is to close, when evil will be overthrown from power, we find it to be 3457 inches, symbolizing 3457 years from the above date, B.C. 1542. This calculation shows A.D. 1915 as marking the beginning of the period of trouble; for 1542 years B.C. plus 1915 years A.D. equals 3457 years. Thus the Pyramid witnesses that the close of 1914 will be the beginning of the time of trouble such as was not since there was a nation – no, nor ever shall be afterward. And thus it will be noted that this "Witness" fully corroborates the Bible testimony on this subject, as shown by the "Parallel Dispensations" in Scripture Studies, Vol. II, Chap. VII. Nor should any doubt the fact that the forty years of "harvest" began in the fall of 1874 because the trouble has not yet reached so portentous and unendurable a stage; and because, in some respects, the "harvest" period since that date has been one of great advancement in knowledge. Remember, too, that the Great Pyramid figures and illustrations including the diagram of the "Pit" were drafted by Prof. Smyth without any reference to this application. Besides, we should remember that the Word of the Lord [C343] clearly shows that the judgments of this time of trouble will begin with the nominal Church, preparatory to its overthrow, and in the strife of selfishness between capital and labor, both of which are now organizing for the culminating trouble. The shape and finish of this lowest room or "Pit" are peculiarly significant. While the top and parts of the sides are regular, it has no floor – its rough, unfinished bottom dropping lower and lower to its eastern side, giving reason for the name, "Bottomless Pit," sometimes applied to it. This room speaks of liberty and freedom as well as of trouble, of elevation as well as of degradation; for, as the traveler reaches it, cramped and weary from the crouched position enforced by the smallness of the "Entrance Passage," he here finds not only a step downward into greater depths, and upon "a troublesome floor," very uneven and broken, but he finds a great elevation also, part of this room being much more lofty than the passageway to it, which is suggestive of greatly enlarged room for his mental organism. How true this is to facts, too. Can we not already see that the spirit of liberty has reached the masses of civilized nations? We do not pause here to consider the consistencies and inconsistencies of the liberties being felt and claimed by the masses – both are suggested in this room by the elevation of the top and the depression of the bottom: we merely note the fact that the light of our day – the Day of the Lord – induces the spirit of liberty; and the spirit of liberty, coming in contact with the pride, wealth and power of those still in control, will be the cause of the trouble which the Scriptures assure us will eventually be very great. Though as yet it has scarcely begun, kings and emperors and statesmen and capitalists, and all men, see it coming, and "men's hearts are failing them for fear, and for looking after the things coming"; for the powers of the heavens are being shaken, and shall ultimately be removed. The evil systems – civil, social and religious – of "the present evil world" [C344] will there sink into oblivion, into destruction, which the subterranean chamber or "Pit" also symbolizes, for we regard the "Pit" as not only a symbol of the overwhelming trouble which will involve the present order of things in an overthrow and destruction (because of their inconsistency with the better order of things to be established under God's Kingdom), but also as a symbol of the certain end of every being who continues to pursue the downward course, and who, under the full enlightenment of the Millennial age, will refuse to break off his sins and pursue righteousness. 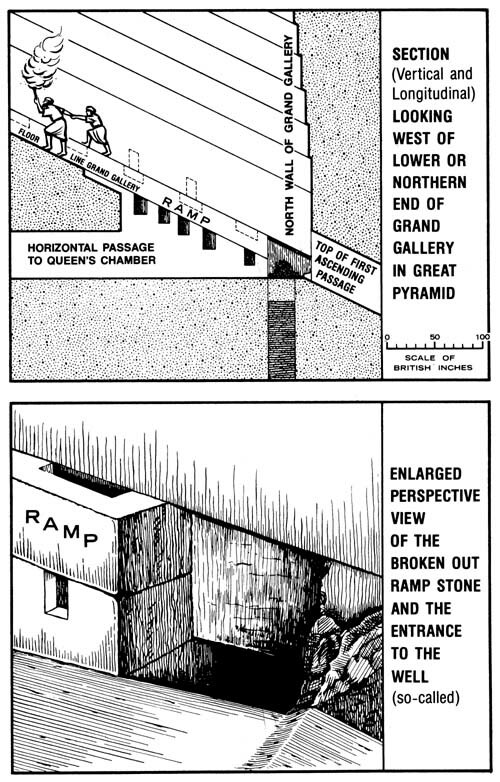 Notice another item in this connection: The "Entrance Passage" has a regular slope downward until it nears the "Pit," when it ceases to slope and runs horizontally. Measuring backward from the entrance of the subterranean chamber or "Pit" to the juncture of the horizontal with the angling portion of the passage, we find the distance to be 324 inches; consequently, the beginning of the level portion of the passage marks a date 324 years before 1915, viz., the year 1590. This would seem to say that at that date (A.D. 1591) something transpired which had a great influence upon the course of civilization, and which in some measure arrested its downward tendency. What transpired at that time? What great movement, marked by that date, has had such an influence? Unfortunately we find no exact measurements of this portion of this downward passage and we are convinced that Prof. Smyth's diagrams are not sufficiently accurate to justify confidence in "paper measurements" based upon them. An unconfirmed measurement is 324 Py. inches, which measured backward would indicate about the year A.D. 1590, or "Shakespeare's day." However, we attach no weight to this suggestion. The Protestant Reformation of the Sixteenth century certainly did accomplish much for the uplift of the world in every way, indirectly. It purged the moral atmosphere of much of its ignorance and superstition, and is admitted by Roman Catholics as well as Protestants to have marked a new era of universal advancement. We are not claiming, as some do, that everything of our day is upward rather than downward. On the contrary, we see many things in our day to which we cannot give assent as even civilized, not to say in accord with the divine will. We see a broader "humanitarian" view prevalent in the world which, while far from the religion of our Lord Jesus, is far in advance of the ignorant superstitions of the past. Indeed it is this social improvement of the world that has given rise to the "Evolution Theory" and caused many to conclude that the world is growing rapidly better and better, that it needed no Savior and his redeeming work, and needs no Kingdom to come with restitution work. Very soon the poor world will realize that uplift and the basis of pure selfishness means increasing discontent, and eventually anarchy. Only the Lord's people, guided by his Word, are able to see these things in their proper light. But while the above measurements were giving their harmonious testimonies, another measurement seemed quite out of harmony with the Bible account; viz., that of the "First Ascending Passage," which presumably represented the period from the time of Israel's exodus from Egypt to the birth of our Lord Jesus. * The Bible account of the time, as already given,+ we could not doubt, having demonstrated its correctness in so many ways. It showed the time from the exodus from Egypt to the year A.D. 1 to be exactly 1614 [C346] years, while the floor-line of the "First Ascending Passage" measures only 1542 inches. Then, again, we knew beyond a doubt, from the words of our Lord and the prophets, that the Law age, and the "favor" to Israel after the flesh, did not cease at the birth of Jesus, but three and a half years after his death, at the close of their seventy weeks of favor, A.D. 36.++ This would make the period from the exodus to the full end of their favor (1614 plus 36) equal 1650 years. And though, in a sense, the grandeur and blessing of the new dispensation began at the birth of Jesus (Luke 2:10-14,25-38), yet the Great Pyramid should, in some way, indicate the full length of Israel's favor. This we finally found to be most ingeniously shown. The granite "Plug" proved to be the exact length to fill out this period to the very limit. Then we knew why that "Plug" was so securely fixed that none had succeeded in displacing it. The great Master-Builder had placed it there to stay, that we might hear its testimony today corroborating the Bible, as to both its plan and its chronology. *This period is not the same as that which, in Vol. II, Chap. vii, we have denominated and described as the Jewish age. The latter began 198 years before the Exodus, at the death of Jacob, and did not end until the Lord, whom they rejected, left their house desolate, five days before his crucifixion. ++See Vol. II, Chap. vii. Thus, exactly, does the stone "Witness" corroborate the testimony of the Bible, and show that the period from the exodus of Israel from Egypt until the full end of their national favor,* A.D. 36, was 1650 years. But let none confound this period with the period shown in the Parallels of the Jewish and Christian dispensations – showing the two ages to be each 1845 years in length, the one from the death of Jacob to A.D. 33, and the other from A.D. 33 to A.D. 1878. *See Vol. II, Chap. iii. And not only was this an ingenious way of hiding and yet furnishing the length of the period from the exodus to the birth of our Lord (to be, in due time, a corroboration of the Bible testimony), but the careful reader will readily see that it could have been done only in some such way, for two reasons: First, because the Jewish dispensation and favor not only began at the death of Jacob, before the exodus from Egypt, but also ran into and parallel to the Christian dispensation for the thirty-three years of our Lord Jesus' earthly life; and, second, because to have made the "First Ascending Passage" long enough to represent fully the Jewish age in year-inches would have necessitated the making of the Pyramid still larger, which in turn would have destroyed its scientific features and lessons. "It is a very stately piece of work, and not inferior, either in respect of the curiosity of art or richness of materials, to the most sumptuous and magnificent buildings....This gallery, or corridor, or whatsoever else I may call it, is built of white and polished marble (limestone), the which is very evenly cut in spacious squares or tables. Of such materials as is the pavement, such is the roof, and such are the side walls that flank it; the knitting of the joints is so close that they are scarce discernible to a curious eye; and that which adds grace to the whole structure, though it makes the passage the more slippery and difficult, is the acclivity and rising of the ascent....In the casting and ranging of the marbles (limestone) in both the side walls, there is one piece of architecture, in my judgment, very graceful, and that is that all the courses or ranges, which are but seven (so great are these stones), do set and flag over one another about three inches; the bottom of the uppermost course overflagging the top of the next, and so in order the rest as they descend." "The circumstances are above the scope of orthodox pictures by reason of the narrow breadth, the lofty, vaulting height, and the very peculiar sloping angle of the long floor; a floor, when one looks from its north end southward, ascending and ascending through the darkness, apparently forever; and with such steepness that no artist's view of it, painted on a vertical plane, could ever hope to represent more than a small part of that floor, rising upward through the whole canvas and going out at the top. While, on looking northward from the south end of the Gallery, you lose the floor instantly, and see on the level of your eyes, in the distance, part of the steeply descending ceiling. Otherwise, it is the solemn overlappings of the high, dark walls, passing you by on either side; but all on an uneasy slant, speaking of toil in one direction, danger in another, and a mountain of strength everywhere." What a wonderful illustration is given in this "Grand Gallery" of the course of the true Christian Church and of [C349] the path of the little flock of overcomers during the long period of the Gospel age. Its once beautiful, cream-white walls and ceiling, formed of regular overlapping stones, all sloping upward, give not the history of the nominal Church, as some have supposed – else they would be far from regular and upward – but they tell of God's great favor bestowed during the Gospel age, the "high calling" to certain liberties and privileges, offered conditionally to all the justified during the Gospel age, opened up by the Well – the ransom. The lofty height of this "Grand Gallery" – seven times the height of the passage representing the Jewish dispensation (seven being a symbol of completeness or fulness) – represents that fulness of blessing contained in the Abrahamic promise, which is actually set before the Gospel Church. The "King's Chamber," at the end of the "Grand Gallery," represents the end of the race to which the present high calling leads all the faithful; and this "King's Chamber," as we shall shortly see, is a most apt symbol of the ultimate destiny of the Church. By the "Well" (which represents the ransom), at the very entrance of this Gallery, and which all must recognize who enter upon this way, our justification is beautifully symbolized. Thus the Great Pyramid tells us, "There is therefore now no condemnation to them that are in Christ Jesus." Looking upward along the "Grand Gallery," we see that it has an end as well as a beginning. Thus we are told that the exceeding great and precious privileges extended during this Gospel age will some time cease – the wonderful high calling to joint-heirship with Christ, as his "bride," will terminate when a sufficient number to complete the "little flock" shall have accepted the call. That which this stone "Witness" thus points out in illustration, the written Word makes very plain, showing, as we have seen, that the privilege of running for the great prize of the "high calling" belongs exclusively to the Gospel age. It was never granted to any before – our Captain, Jesus, being the first to whom it was offered, the first to accept its conditions of sacrifice and the first to enter into its rewards. The south end of the "Grand Gallery" as positively marks the end or limit of the call to the divine nature as the north end of it marks the beginning of the offer of that great favor. But since the "Grand Gallery" represents our "high calling" of God, let us look beyond and note what this call leads to in the case of each individual. We have already seen in the Scriptures that we are called to suffer with Christ, to become dead with him, and afterward to enter into his glory. And all this we find strikingly symbolized in the peculiar manner by which entrance is gained to the "King's Chamber," at the end of the "Grand Gallery." The way by which those who accept the "high calling" may enter the heavenly glory, represented by the "King's Chamber," is not direct. They must first be tested in all points and be found obedient to the will of God, else they cannot enter into the rest that remaineth. This, the Scriptural teaching, and the experience of all running for the great prize, is thus forcibly illustrated by the Great Pyramid. As the call leads to consecration and lessons of sacrifice, so the "Grand Gallery" leads to certain low passages which symbolize these. Having [C351] arrived at its upper end, the traveler must stoop very low at the doorway or passage which leads into the "Ante-Chamber." This stoop symbolizes the consecration or death of the human will, the beginning of the self-sacrifice, whereunto all are called who would attain to the divine nature. How much this self-sacrifice means is known only to those who have accepted the call, and who have actually surrendered the human will. This low passage, representing consecration, being passed, we are in what is known as the "Ante-Chamber." Here the floor ceases to be limestone: from this point onward the tread is to be on solid granite, which may be interpreted as a new standing, or a standing as "new creatures." But when placing foot upon the granite floor, to enter upon the new standing as new creatures, a huge obstruction of granite is noticed: it is known as the "Granite Leaf." This, like a drop-door, partly closes the way, leaving only a low passage like the one just passed, forty-four inches high, so that we must stoop again before we can enjoy fully the privileges represented in the "Ante-Chamber." This "Granite Leaf" represents the divine will, and seems to say to one who has just passed the low passage representing the surrender of his own will, "It is not enough that you should sacrifice your will, plans and arrangements; you might do all that, and then take up the will and plan of another; you must not only sacrifice your own will, but you must bow to the divine will, and accept it instead of your own, and become active in God's service, before you can be counted a new creature and an heir of the divine nature." And not only the death of the will, but also actual death, must be passed before we enter fully and actually the conditions of our "new," "divine nature." And this, too, is shown by the stone "Witness"; for at the farther end of the "Ante-Chamber" is a very low passage through which entrance to the "King's Chamber" is gained. Thus the "King's Chamber," the grandest and highest room of the Pyramid, becomes the symbol of the perfection of the divine nature to be gained by the "little flock," the few overcomers chosen out of the "many called" (whose calling is symbolized by the "Grand Gallery"), who pass through self-sacrifice and trial (symbolized by the "Ante-Chamber," and the low passages into and from it). The call to the "divine nature" came first to our Lord Jesus, whose mission to earth was for a twofold purpose: (1) to save sinners by paying the ransom price for Adam, and all in him, and (2) that by that obedience unto death he might be proved worthy of the divine nature and [C353] [C354] [C355] glory. Hence it is that the "Grand Gallery" is shown as commencing at our Lord's birth. It does not, therefore, symbolize the Gospel age, for that did not commence until Jesus had made an end of the Law age by his sacrifice on the cross, thirty-three years after his birth; but it does symbolize the high or heavenly calling (through sacrifice) to the divine nature – the "King's Chamber." Our Lord Jesus was thus called from the moment of his birth; and, since Pentecost, all justified believers are called to the same high privilege, however few accept the call to sacrifice, and however few make their calling and election sure by hearty compliance with the conditions – walking in the Master's footsteps. And the length of time during which this "high calling" to the divine nature lasts, and when it ceases, is what is indicated by this "Grand Gallery's" length and termination, as already shown. "It is a very noble apartment, 34 feet long, 17 feet broad, and 19 feet high, of polished red granite throughout; walls, floor and ceiling in blocks squared, true, and joined together with such exquisite skill that no autocrat emperor of modern times could desire anything more solidly noble and refined. The only thing this chamber contains is an empty [granite] coffer [or stone box] without a lid; and it is worthy of notice that this coffer corresponds with the sacred ark of the Mosaic Tabernacle in capacity." Nor is this all: we find that the same great truths which were symbolically represented in the two apartments of the Tabernacle and the Temple, the Holy and the Most Holy, and their separating veils, are exactly matched in the Great Pyramid by the teachings of the two apartments, the "Ante-Chamber" and the "King's Chamber," and their low separating passages. The "Ante-Chamber," like the Holy of the Tabernacle, represents that condition of relationship to God, as a reckoned new creature, and joint-heir with Christ of the divine nature and glory, which the believer enters when, after accepting forgiveness of sins and reconciliation with God through the ransom, he presents his justified self a living sacrifice to God's service. As the first veil of the Tabernacle represented the consecration or resignation or death of our own will, and the full submission to God's will, so the low entrance to the "Ante-Chamber" symbolizes this same great event, which begins the newness of life in all who will ever be members of the royal priesthood. This test, representing the laying of our all upon the altar, having been passed, the believer is no longer reckoned as a human being, but as a "new creature," a "partaker of the divine nature." Though, as a matter of fact, he will not be made an actual sharer of the divine nature until he shall have faithfully learned the lesson of obedience to the divine will, in the actual experiences and daily sacrifices and schoolings of the present life (represented in the "Ante-Chamber" walls, of peculiar construction, and in the Table of Shew-bread, the Golden Candlestick and the Incense Altar in the Holy of the Tabernacle); and not until he shall have passed through death itself (represented by the second veil of the Tabernacle and by the second low passage leading into the "King's Chamber" of the Pyramid); and until, by a share in the First Resurrection, he shall have entered with Christ into the fulness of the promised divine nature and glory – his everlasting portion, symbolized in the "King's Chamber." It will be noticed from the illustration that the granite floor does not reach quite to the front of the "Ante-Chamber," while the granite of the ceiling reaches the full length of the room. This seems to teach a lesson in harmony with what we have already seen to be a feature of the divine plan, as it relates to those called-out ones who are seeking to enter upon the divine nature. The first low passage symbolizes the consecration of the believer's human will, which really gives him entrance into the "Holy" or sanctified condition as a prospective heir of glory and immortality, represented in the "Ante-Chamber," whose granite ceiling now covers him; yet such a one is not to be considered as having entered fully into the new nature until "quickened" into activity and newness of life; and this test is represented by the "Granite Leaf," which, from its peculiar position, hanging, as though ready to drop and thus block all further progress, seems to say, "Pilgrim, even though you have come thus far and have consecrated yourself to God, unless you become quickened by the spirit of the truth to activity in his service, you will still have no real standing in the divine nature to which you have been called or invited." The three steps by which the called ones of the Gospel age are to enter the glory of their Lord are thus marked in the Great Pyramid as well as in the Scriptures. They are (1) Consecration, or begetting of the spirit through the Word of truth, symbolized by the low passage into the "Ante-Chamber"; (2) Quickening to active service and sacrifice through sanctification of the spirit and belief of the truth, symbolized by the low passage under the "Granite Leaf"; (3) Birth of the spirit into the perfect likeness of our Lord by a share in the First Resurrection, symbolized by the low passageway into the "King's Chamber." 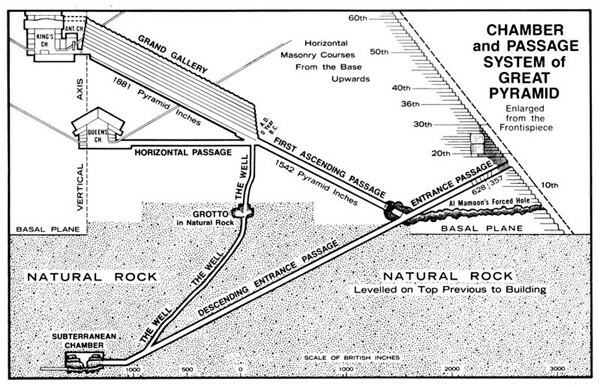 By reference to the illustration, page 333, it will be noticed that an imaginary line drawn through the vertical axis of the Great Pyramid would leave the "Queen's Chamber" and its "Horizontal Passage," the "Entrance Passage," the "First Ascending Passage" and the "Grand Gallery," all on the north side of that line or axis, and only the "Ante-Chamber" and the "King's Chamber" on the south side of [C358] it. By this arrangement the designer of the Great Pyramid (Jehovah) points out to us the distinction of natures, as noted in Vol. I, Chap. x. The "Queen's Chamber," representing the perfection of humanity after the Millennial age shall have restored all the obedient and worthy ones to the moral likeness of the Creator, teaches, by the fact that its back or farthest wall is on a line with the Pyramid's axis, that, thus restored to God's image and likeness, though still human, mankind will be close to the divine nature – as close as one nature could be to another nature of which it is a likeness. And all the upward passages leading in the direction of that axis teach that the desires and efforts of God's people are all to be toward human perfection, while those of the called-out Church of the Gospel age are to go beyond human perfection. They, as joint-heirs with Christ, are to enter into the fulness of the divine nature. 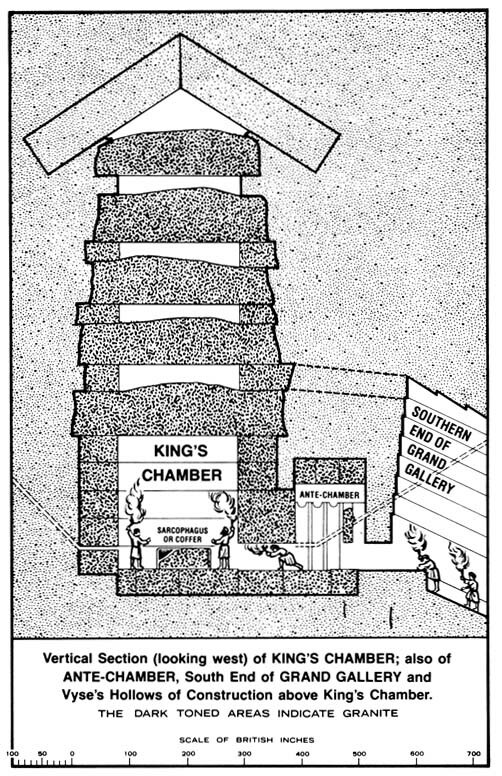 The fact that the "Subterranean Chamber" or "Pit," representing trouble and death, does not lie wholly on the same side of the vertical axis as the "Queen's Chamber" and its passage does not militate against this interpretation; for, strictly speaking, it is no part of the Pyramid structure at all. It lies under the Pyramid, far below its basal line. But it may have another lesson to impart. A vertical line from its farthest wall would pass exactly along the farthest wall of the "Ante-Chamber"; and the lesson drawn might be, in harmony with the Scriptural warning, that it is possible for some who have entered the "Holy" or sanctified condition (who have been begotten by the word of truth, and who have even been quickened by it) to commit the sin that is unto death – the second death. Another item worthy of note in connection with the vertical axis of the Great Pyramid's structure above its basal line is this: our Lord's first advent and his death, marked by the "Well's" mouth, are on that side of the Pyramid's axis which represents the human nature; and its location on the same level as the passage leading to the "Queen's Chamber," which symbolizes human perfection, is also noteworthy. The Great Pyramid thus seems to say: "He was made flesh" – the man Christ Jesus gave himself "a ransom for all"; yet he knew no sin, was holy, harmless, separate from sinners, and had no part whatever in the downward, sinful course of Adam's race (symbolized in the passage to the "Pit"). Moreover, the location of the "Grotto" and the fact that it was natural and not hewn are significant. It evidently symbolizes the death of our Lord Jesus. The fact that it was natural teaches that the Lord's sacrifice of himself was not an expediency, but a foreordained, prearranged matter in Jehovah's plan, before the outworking of the plan symbolized by the Pyramid began. The fact that it is located above and not below the basal line of the Pyramid seems to teach another lesson in harmony with the Scriptures – that though our Lord died as a ransom for sinners, he did not descend into sin and degradation, but even in his death was within the limits and bounds of the divine plan, as symbolized in the Pyramid structure above the basal line. Now a question of great interest arises: Will the Pyramid's testimony concerning the time of the close of the high calling corroborate the testimony of the Scriptures on this subject? Will it show the end of the "Grand Gallery" at the exact time the Scriptures assure us that God's call to this favor ceases? Or will it contradict what we have learned from the Scriptures, and show either a longer or a shorter period of calling to the divine nature? Well, we can say nothing less of it; for its testimony agrees fully and in every detail with the entire plan of God as we have learned that plan from the Scriptures. Its wonderful correspondencies with the Bible leave no room for doubt that the same divine inspirer of the prophets and apostles inspired this "Witness" also. Let us examine some of these harmonies particularly. The floor-line of the "Grand Gallery," from the north to the south wall, has been twice very carefully measured in recent years, and three distinct sets of measures have been obtained. One measure (a) is from the wall at the north end, measured to the "Step" and then – omitting its riser or front – along its upper surface, the walking surface of the "Grand Gallery's" floor; another measure (b) shows the length measured through the "Step," as though the "Step" were not there; another measure (c) gives the entire surface of the floor and up the front or riser of the "Step" and along its top surface. Prof. Smyth found the first of these measures (a) to be 1874 Pyramid inches, the second (b), 1881 Pyramid inches, and the third (c), 1910 Pyramid inches; while Mr. Flinders Petrie reports these measures eight-tenths of [C363] an inch longer. A reasonable estimate, therefore, and undoubtedly very nearly a correct one, would be to call these figures (a) 1875, (b) 1882 and (c) 1911 Pyramid inches. Now we inquire, If the inches of the floor-lines of these passages represent a year, each, as claimed and admitted by Pyramid students, what date would these measures of the "Grand Gallery" indicate as the end of the high calling to the divine nature, which the "Grand Gallery" symbolizes? We answer, that in applying these inch-years to our present reckoning of time, we must remember that our date A.D. is one year and three months behind the actual date, as shown in Vol. II, pages 54-62. And while this would make no difference in calculating a period from a fixed date B.C., or from a fixed date A.D., it should be recognized in this case. Where the same event, the birth of Jesus, is the starting point, the error in our date A.D. must be allowed for, to reach correct results. For simplicity we will take our erroneous A.D. as the standard, and will scale down the Pyramid figures to correspond, by deducting one and one-fourth inches from them, so that they will correspond with our common reckoning. Thus reduced, they would show (a) 1875 less 1¼ equal 1873¾ (b) 1882 less 1¼ equal 1880¾ and (c) 1911 less 1¼ equal 1909¾, and give the dates (a) October, 1874, (b) October, 1881 and (c) October, 1910 A.D. This threefold ending is in full accord with what we have found taught in the Scriptures: that the "harvest, the end of the age," was reached in October, 1874, and that the "call" proper ended in October, 1881, while a period would follow during which, though the general call had ceased, the same privileges would be extended to some worthy ones, in order to supply the places of some already among the called who, under trial, will be found unworthy of the crowns allotted to them when they accepted the call. How long this sifting of the consecrated will last, during which some will be granted the crowns of those adjudged unworthy, and their names written instead of some whose names will be blotted out (Rev. 3:5,11), the Scriptures do not, so far as we have yet seen, indicate; but this date, 1910, indicated by the Pyramid, seems to harmonize well with the dates furnished by the Bible. It is but a few years before the full close of the time of trouble which ends the Gentile times; and when we remember the Lord's words – that the overcomers shall be [C364] accounted worthy to escape the severest of the trouble coming upon the world we may understand the reference to be to the anarchous trouble which will follow October, 1914; but a trouble chiefly upon the Church may be expected about 1910 A.D. Nor is this all of the wonderful symbolism of the Great Pyramid. Its marvelous harmony with the divine plan is still further shown in another remarkable feature. We should expect that the date of the two great events connected with the close of this age, viz., (1) our Lord's second advent and (2) the beginning of the harvest, would in some [C365] manner be marked at the upper end of the "Grand Gallery," even as his death and resurrection are marked by the "Well" at its lower end. And in this we are not disappointed. In the upper or south end of the east wall, at its top, high above the step, there is an opening connecting with the unfinished space above the "King's Chamber," as shown on the diagram. In the Pyramid's symbolic language that opening says, "Here a heavenly One entered – One who needs no floors to walk upon, but who can come and go like the wind." And Prof. Smyth's careful measurements of this south wall of the "Grand Gallery" inform us that it is not exactly perpendicular, but leans over at the top seven inches. * The Pyramid thus says to us, "Seven years before the close of the high calling [before October, 1881] the great One from the heavens will enter." And it further indicates that from that time – October, 1874 – gradually, as indicated by the sloping of the south wall, the call would be drawn to a close and fully end in October, 1881. This, it will be noticed, is in exact accord with the Bible's testimony as outlined in this and preceding volumes of Studies in the Scriptures. And let it be remembered, too, that we who understood the Scriptural presentation of these times and seasons had nothing to do with the taking of these measurements of the Great Pyramid; and that they who took the measurements knew nothing of our application of the prophecy at the time the measurements were taken, nor do they yet, so far as we know. We ask, therefore, Could such exactness in matters which concern six thousand years of history on the one hand, and thousands of inches of Pyramid measurements on the other, be a mere accidental coincidence? Nay; but verily truth is stranger and more wonderful than fiction. "This is the Lord's doing; it is marvelous in our eyes." Further, where the special favor of the general Gospel call ceased (October, 1881), the blessing upon the world would seem to be due to have a beginning. The "Well," which marks at its upper end the ransom which secures the coming blessing, should, it would seem, at its lower end (where it connects with the downward passage) mark the date when restitution blessings would begin to reach the world. It seems to say, Here the benefits of the ransom will [C366] begin to bless all the families of the earth, when the elections or selections of the Jewish and Gospel ages are completed. Now if we adopt the clearly marked close of the special call and favor of the Gospel age, 1881, as the date at which the call to restitution blessings was due to have a beginning, and if we regard the lower terminus of the "Well" as marking that date (1881), we find something of interest by measuring back along that "Entrance Passage" to the original entrance of the Pyramid. This distance we find to be 3826 pyramid inches, thus representing 3826 years. And if our supposition be well founded, 3826 years before A.D. 1881 some notable event must have occurred. And as we search the historic records of God's Word to see if any notable event occurred at that time, we find a remarkable confirmation of our supposition; for, just 3826 years before A.D. 1881, which would be B.C. 1945, Isaac, the typical seed of promise, became the heir of all his father Abraham's wealth, and was thus in position to bless all his brethren – Ishmael, the son of Hagar (type of fleshly Israel), and the many sons and daughters of Keturah, Abraham's second wife (typical of the world in general). We measure the time from the date of Isaac's inheritance, and consequent privilege of blessing his brethren, to the year A.D. 1881, thus: Isaac came into possession of his inheritance at the death of his father Abraham, which occurred 100 years after the Abrahamic Covenant was made (for Abraham was 75 years old when the Covenant was made, and he died at the age of 175 years). Then from the Covenant to the death of Jacob, Isaac's son, was 232 years;* and from the time that Isaac came into his inheritance – 100 years after the Covenant was made – to the death of Jacob would be 132 years (232 years less 100 years). To this we add the 1813 years from the [C367] death of Jacob to our Anno Domini, and we have the date 1945 B.C., the date when the typical Isaac came into possession of all that Abraham had. (Gen. 25:5) And this 1945 years B.C. added to the 1881 years A.D. makes the 3826 years indicated in the Pyramid inches as the length of time that must elapse between the typical blessing of his brethren by the typical seed, Isaac, and the blessing of the whole world through the antitypical Isaac, the Christ. *See Vol. II, pages 231,232. *Although we had not thought of the coincidence until now, while writing this chapter, it is not a little remarkable that it was during the last six months of the year 1881 that Food for Thinking Christians, a book of 166 pages, was issued, and circulated to the extent of one million four hundred thousand copies throughout the United States and Great Britain. Three items connected with that book and its wide and sudden distribution contribute to mark it as at least peculiar: (1) Perhaps no other book ever reached so large a circulation in so brief a space of time, or by the same methods. It was distributed gratuitously at the church doors in all the largest cities of the United States and Great Britain by the messenger boys of the District Messenger Service on three successive Sundays, and in the smaller towns through the mails. (2) The money to defray this expense ($42,000) was voluntarily donated for the purpose, without solicitation. (3) It was, so far as we know, the first book ever published which pointed out the distinction between the high calling of the Gospel Church and the Restitution favors for the world in general, and it pointed out the date of the close of that high calling as October, 1881. Another point to be noticed is, the pathway upon which [C368] the world will be invited to come and receive life everlasting in the Millennial age. As the upper apartment, known as the "King's Chamber," represents the divine nature, and the "Grand Gallery" represents the call to it, so the one under it (the "Queen's Chamber") represents the perfect human nature; and the way to it illustrates the path to life in which the world must walk to reach human perfection during the Millennium. Both of these ways, and hence both of these ultimate results, were opened up and made possible by the ransom-sacrifice which the Mediator gave on behalf of all: all of which is forcibly indicated in the Pyramid by the "appearance of an explosion," which opened the mouth of the "Well," and gave access to the two passageways (intended to symbolize the call of the Church now, leading to the divine nature, and the call of the world during the Millennium, leading to the restitution of human perfection). The only entrance to the "Queen's Chamber," or to the "Grand Gallery," was by way of the "Well," the "First Ascending Passage" having been originally impassable by reason of the granite "Plug." Thus the stone "Witness" testifies that by the Law Call or Law Covenant none of the fallen race could reach either life (human life) or immortality (the divine nature). Though the "First Ascending Passage" was a way, yet none could walk in it. So the Law Covenant was a passageway to life; but because of the weakness of the flesh, none could walk in it so as to attain the life offered. (Rom. 3:20) The cross, the sacrifice, the ransom, is thus specially marked by this stone "Witness," just as in the Scriptures it is more prominently marked than any other feature of the plan. "No man cometh to the Father but by me," said Jesus. "I declared unto you first of all that which I also received [first of all], how that Christ died for our sins," said Paul. (1 Cor. 15:3) "The 'Well' [representative of Christ's sacrifice and resurrection] is the [C369] only way to life and immortality," says the Great Pyramid. 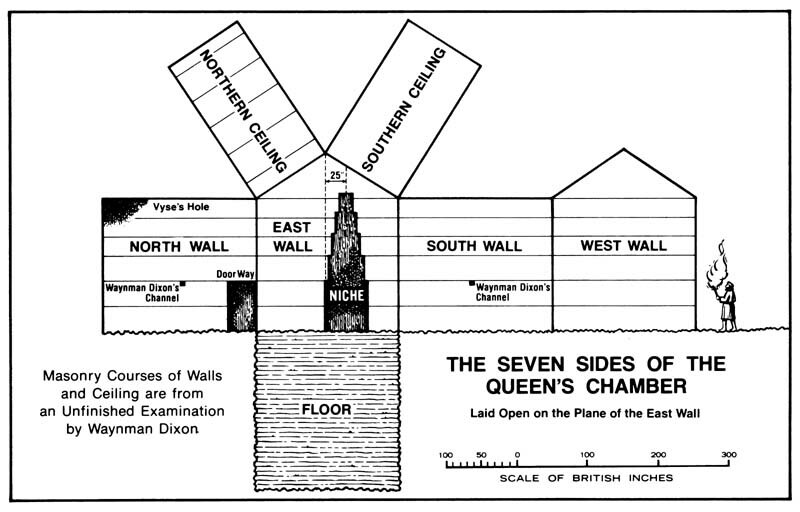 The "Queen's Chamber" symbolizes the end of the restitution work – human perfection – in that it has seven sides, counting the floor one side, and the roof two sides, as shown in the diagram. The path to it tells the same story of sevenness, or perfection, for the floor of it is depressed for one-seventh of its length. And not only is the number seven a general symbol of perfection and completeness, but it is specially suggestive in this connection, since the Millennial age is the seventh thousand years of the earth's history, and the one in which perfection is to be attained by the willing and obedient of the race. Prof. Smyth remarks the peculiarity of the floor of this "Queen's Chamber" and the passageway leading to it, that it is rough and entirely unfinished, thus differing from the other passages, which were originally very smooth, probably polished. This, he suggests, may indicate that its floor is not subject to measurement by year-inches as are the other passages – as if the Pyramid by this unevenness would say, "Time-measures are not recorded here." But though the Pyramid inch-year is not observed in the passage to the "Queen's Chamber," nor in its floor, another matter did require to be shown, namely, the way of restitution to perfect life and perfect human organism. As this perfection of human nature is illustrated in the "Queen's Chamber," so the way to it represents the seven thousand years of experience and discipline through which the fallen human race must pass before full restitution to perfection can be gained. Inasmuch as the first six-sevenths of the passageway to the "Queen's Chamber" is extremely low, it [C370] represents the six thousand years past, and illustrates the extreme difficulty and humility necessary to walk a justified life, even on the part of such as sought so to walk – the patriarchs, prophets and others, justified through faith – during this six thousand years of the reign of sin and death. On the contrary, the last seventh of the way represents the Millennial age, just dawning upon men. Its height being nearly twice as great indicates that during the coming thousand years of grace and peace on earth men can progress with comfort and ease toward full perfection. Is it asked whether any have walked in this way during the past six thousand years? We answer, Yes; by faith some have walked in it. It is the way of justification of human nature, though wholly different from the way and calling of the Gospel Church, which, though through justification, is to the new, divine nature. Abraham, Isaac and Jacob and the faithful prophets walked that way – entering by the "Well" – by faith in the ransom-sacrifice of Christ, which they represented by typical sacrifices before our Lord's death, and before the stone "Witness" pointed to it; for in God's purpose and revelation Christ was the slain Lamb of atonement from before the foundation of the world. And this way to the "Queen's Chamber" agrees well with the Bible record concerning the way to perfect human nature and life during the Millennium. The length of time needed to reach perfection will differ in individual cases, according to the rapidity or slowness of the individual to submit his heart and life to the conditions of the New Covenant. It will no longer be a struggle upward, continually opposed by downward tendencies within and without, as it has been during the Law and Gospel dispensations; but it will be a way in which everything will favor the traveler, and facilitate his rapid progress toward full perfection of restitution-life, with all its resultant blessings. As the "King's Chamber," by its ventilating tubes, indicates that it symbolizes a permanent residence, an everlasting condition, so the "Queen's Chamber" symbolizes the fact that the condition of human perfection, when reached, may be made an everlasting state; for it also has similar ventilating tubes or air passages provided. In one case we may say it symbolizes a permanent condition, and in the [C371] [C372] [C373] other that it may be made a permanent or everlasting condition, because this is the fact as indicated both by the Scriptures and by the testimony of the stone "Witness." The Scriptures say of those who attain the condition represented by the "King's Chamber," that they partake of the divine nature, and are immortal, or proof against death – that they cannot die thereafter. And they show that those others who reach the full restitution, and stand the last test of loyalty, at the end of the Millennial age, though they will not possess that quality termed Immortality, which is essentially an element of the divine nature only, will be supplied with life everlasting under provisions already arranged by the great Architect of the plan of salvation. If they abide in harmony with God and in obedience to his will, they will live forever. The Great Pyramid declares these same truths; for while the "King's Chamber" had open ventilators, the ventilators in the "Queen's Chamber" were originally peculiarly covered. The air-tubes were complete from the outside of the Great Pyramid to within about five inches of the surface of the inner walls of the "Queen's Chamber," the stones on either side of the "Queen's Chamber," except the said five inches in thickness, having been chiseled out, showing design on the part of the Great Pyramid's Architect, just as every other feature shows it. Mr. Waynman Dixon made this discovery while examining the walls of the "Queen's Chamber." He noticed that the wall at a certain spot sounded hollow, and, breaking through the surface, he found one ventilating tube; and then by the same process he found its mate in the opposite wall. Thus the Pyramid, in harmony with the Scriptures, declares that ample provision has been made, whereby the perfect human condition, represented by the "Queen's Chamber," may be an everlasting condition to each one who conforms to its regulations and laws. "If the primeval man were nothing but a gorilla or troglodyte, how, in those prehistoric times, could the builders of this mighty structure have known what our profoundest [C375] savants, after a score of centuries of observation and experiment, have been able to find out only imperfectly? How could they know how even to make and handle the tools, machines and expedients, indispensable to the construction of an edifice so enormous in dimensions, so massive in its materials, so exalted in its height and so perfect in its workmanship that to this day it is without a rival on earth? How could they know the spherity, rotation, diameter, density, latitude, poles, land distribution and temperature of the earth, or its astronomical relations? How could they solve the problem of the squaring of the circle, calculate the proportions or determine the four cardinal points? How could they frame charts of history and dispensations, true to fact in every particular, for the space of four thousand years after their time, and down to the final consummation? How could they know when the Mosaic economy would start, how long continue, and in what eventuate? How could they know when Christianity would be introduced, by what great facts and features it would be marked, and what would be the characteristics, career and end of the Church of Christ? How could they know of the grand precessional cycle, the length of its duration, the number of days in the true year, the mean distance of the sun from the earth, and the exact positions of the stars at the time the Great Pyramid was built? How could they devise a standard and system of measures and weights, so evenly fitted to each other, so beneficently conformed to the common wants of man, and so perfectly harmonized with all the facts of nature? And how could they know how to put all these things on record in a single piece of masonry, without one verbal or pictorial inscription, yet proof against all the ravages and changes of time, and capable of being read and understood down to the very end? "Men may sneer, but they cannot laugh down this mighty structure, nor scoff out of it the angles, proportions, measures, nature references and sacred correspondencies which its Maker gave it. Here they are in all their speaking significance, stubborn and invincible beyond all power to suppress them." The voice of this wonderful "Witness" brings forcibly to mind the words of our Lord on that notable occasion of his [C376] triumphal entry into Jerusalem, when he typically presented himself to Israel as their king, amidst the acclamations of the whole multitude of his disciples, who were loudly praising God for the mighty works that had been done, saying, "Blessed be the king that cometh in the name of the Lord! peace in heaven, and glory in the highest." And when the Pharisees were urging him to rebuke them, he answered, "I tell you that if these should hold their peace, the stones would immediately cry out." (Luke 19:37-40) And so it is today: while the King of glory has actually come, and while the great majority of his professed living witnesses, who should be loudly rejoicing, and saying, Blessed be the King that cometh in the name of the Lord, are dumb – some from fear of being put out of the synagogue, and some from drowsy slothfulness, or from the intoxication of worldliness which keeps them in ignorance of the time of our visitation – lo, the very stones of this Great Pyramid of Testimony are crying out in no uncertain tones. Every inch of this massive structure is eloquently proclaiming the wisdom and power and grace of our God. Firmly incased in this solid rocky structure, beyond the power of nature's storms or of the ruthless hand of the destroyer, the outline drawings of God's great plan have stood for four thousand years, prepared to give their testimony at the time appointed, in corroboration of the similarly revealed, but for ages hidden, testimony of the sure Word of Prophecy. The testimony of this "Witness to the Lord in the land of Egypt," like that of the written Word, points with solemn and unerring precision to the final wreck of the old order of things in the "Pit" of oblivion, and to the glorious establishment of the new, under Christ Jesus, the great Chief Corner-stone of God's eternal building, in conformity with the lines of whose glorious character all things worthy of everlasting existence must be built up under him. Amen! Amen! Thy Kingdom come! Thy will be done on earth as it is done in heaven!